A vehicle that receives many awards and strong reviews is often a great vehicle. That seems like a common sense conclusion, but too often consumers only go by what they hear on radio or T.V. Grapevine Ford is here to give you the straight facts from a variety of automotive journalists and awards companies so you know what you're getting into before you take a test drive. 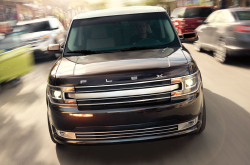 Consider the new 2013 Ford Flex: It features a winning combination of unique styling, good fuel economy and class-leading technology features. Awards include a mention on the "10 Best Family Cars" list by Kelley Blue Book and a "Breakthrough Product Award" from Popular Mechanics. The latter was given as a result of the Flex's rear inflatable seat belts, the first of their kind. The former was awarded due to this stylish SUV's distinctive mix of great features, capable engine options and abundant interior room. That's not where the praise stops for the 2013 Ford Flex: Automobile Magazine writes, "The Ford Flex is a compelling alternative to a minivan or large SUV because it offers smart styling, generous interior room, and a pleasant driving experience." The well-respected reviewers from Edmunds.com said, "The 2013 Ford Flex has the space, the versatility, the features and the driving dynamics to make it a top choice among large family sedans." The newly redesigned 2013 Flex isn't just a slice of the American Dream, it's the whole pie. Learn all about the Ford Flex SUV's features, specs and amenities in the review below. Check out the 2013 Ford Flex alongside versus similar autos like the 2013 Honda Odyssey, Chevrolet Tahoe, Buick Enclave and the Dodge Durango, and you will notice that the 2013 Flex outshines those vehicles in gobs areas. Pay attention to the reasons see why! Ford Flex owners won't get the same wonderful factory-trained Ford mechanics and authentic Ford parts at a aftermarket service company. But at our Grapevine dealership you'll have access to this anytime you visit, along with the bliss that comes with obtaining a long-term service warranty. Grapevine Ford's certified mechanics will keep your Flex in tiptop shape. Whether you need us to call the shots on a simple job as an oil change, or take on challenging Ford service and repairs like transmission rebuilds, strut and shock repairs, timing belt replacements. Plus, Grapevine Ford's always got cut-rate prices on Ford repairs in Grapevine, even for easy to complete OEM recommended maintenances. Follow the link below to see our current service specials. There you have it - the award-winning 2013 Ford Flex. We encourage you to visit Grapevine Ford for a test drive in this excellent full-size SUV. Other Dallas-area Ford Flex shoppers have told us they love it because it has something for everyone; we think it can have something special for you, too! Before you look at the Chevy Traverse or Mazda CX-9, consider what Consumer Guide said about the Flex: "Regardless of which model suits your fancy, Flex delivers good handling and refined overall behavior. This is a large, comfortable people mover that merits attention in its class." All of us at Grapevine Ford couldn't agree more. Contact us today to schedule a test drive or talk about the various leasing, buying and financing options at your disposal. View your 2013 Ford Flex today!